2 very Large onions sliced thin and fried in oil untill light brown . Handful of fried and crisp onions . 2 Tbsp of ghee or clarified butter . 1.Apply meat tenderizer or papaya paste on meat , 1/2 tsp of salt and keep it overnight in the refrigerator. 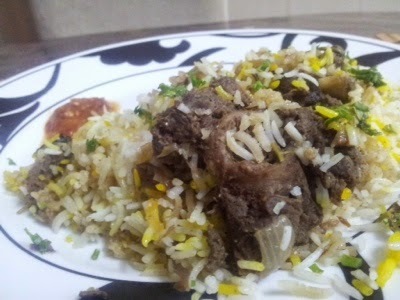 2.Marinade goat meat with all above ingredients for 2 hours in a refrigerator. A )Wrap above ingredients in one small cloth tie and leave it into boiled water . B)Let it boil for 2 minutes then put rice .This allows rice to be cooked in whole masala flavour . 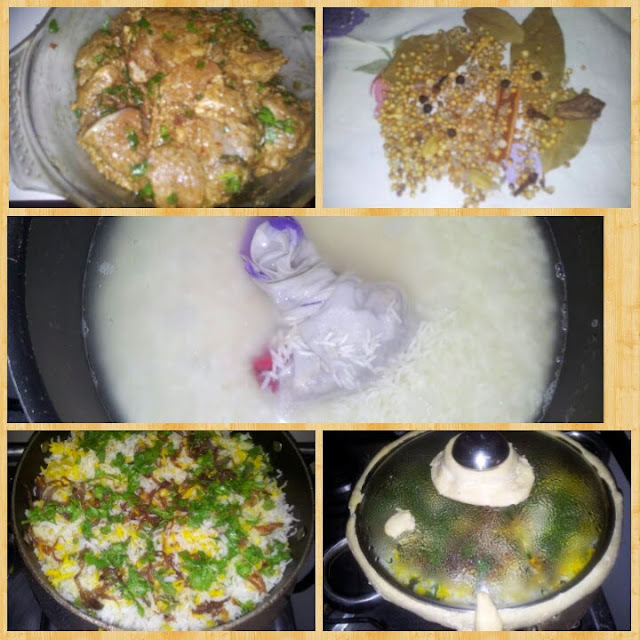 C)Cook rice untill 40 % done . D) Drain them and keep. 4. Take large cooking pot and make layer of marinated meat . 5. Make another layer of cooked rice . 6. Put all ingredients for top most layer . 7. Close lid tightly with dough from all sides . 8. Put a flat pan on medium low fire and put your biryani pot on it . 9. 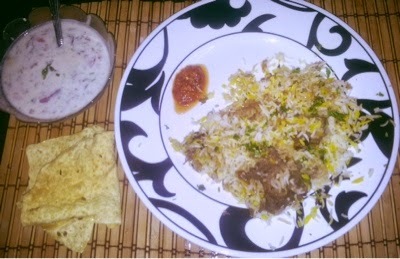 Let your biryani cook for 50-55 minutes then turn off heat and let it sit for 20 minutes in closed container . 10. Serve with raita and red chilli garlic chutney . Note : its extreamly important to tenderize meat before cooking then only its going to cook nice ,tender and juicy .